© Fingelkurts et al. ; Licensee Bentham Open. Electroencephalogram (EEG) recordings are increasingly used to evaluate patients with disorders of consciousness (DOC) or assess their prognosis outcome in the short-term perspective. However, there is a lack of information concerning the effectiveness of EEG in classifying long-term (many years) outcome in chronic DOC patients. Here we tested whether EEG operational architectonics parameters (geared towards consciousness phenomenon detection rather than neurophysiological processes) could be useful for distinguishing a very long-term (6 years) clinical outcome of DOC patients whose EEGs were registered within 3 months post-injury. The obtained results suggest that EEG recorded at third month after sustaining brain damage, may contain useful information on the long-term outcome of patients in vegetative state: it could discriminate patients who remain in a persistent vegetative state from patients who reach a minimally conscious state or even recover a full consciousness in a long-term perspective (6 years) post-injury. These findings, if confirmed in further studies, may be pivotal for long-term planning of clinical care, rehabilitative programs, medical-legal decisions concerning the patients, and policy makers. Keywords: Brain operations, consciousness, EEG-a and b-rhythms, functional connectivity, minimally conscious state (MCS), neuronal assemblies, operational synchrony, synchronization, unconsciousness, vegetative state (VS). Patients with severe brain damage have different clinical outcomes that usually manifest within a year after injury [1-3]. The worst possible outcome of acquired brain injury (excluding death) is a vegetative state, recently named “unresponsive wakefulness syndrome” (VS/UWS) . The VS/UWS is commonly agreed to be a state of “wakeful unconsciousness”  of self and environment in which “the patient breathes spontaneously, has a stable circulation, and shows cycles of eye closure and opening which may simulate sleep and waking” . Another outcome or stage of recovery is characterised by a minimally conscious state (MCS), which is “a condition of severely altered consciousness in which minimal but definite behavioural evidence of self or environmental awareness is demonstrated” . MCS often fluctuates, especially at the borderline with VS/UWS, meaning that it transiently appears and disappears. Finally, emergence from MCS (E-MCS) is defined by the return of full conscious communication and/or object use  and is consistent with full awareness of self, others, and the environment . Currently electroencephalogram (EEG) recordings are increasingly used to evaluate patients with disorders of consciousness (DOC) ; and accumulated published data indicate the importance of EEG when assessingthe degree/type of brain damage and the prognosis of patients in the early stages of DOC [9-14]. The EEG analysis approaches include either the simplest conventional measures based on the qualitative visual evaluation of EEG traces or the use of ad hoc scales [10, 11, 15], or a number of analytical algorithms aiming at extracting quantitative EEG parameters in an attempt to classify the severity of brain damage or assess outcome prognosis [16-25]. EEG is a particularly well-suited technology for this purpose: it is routinely available in most clinics/laboratories, non-invasive, and relatively inexpensive, it allows for repeated or extended measurements at the bedside, and it directly measures neuronal dynamics that is remarkably correlated with behavior, cognition, and consciousness [26-31]. However, there is a lack of information concerning the effectiveness of EEG analysis for the ascertainment of long-term (many years) outcomes in chronic DOC patients , despite the fact that it may have crucial importance for long-term planning of clinical care, rehabilitative programs aiming to improve the patients’ wellbeing and recovery, and medical-legal decisions concerning the patients, as well as for the families of patients and policy makers. For example, since 90s Dutch ethical, medical, and legal legislation considers life-sustaining treatment, including artificial nutrition and hydration (ANH), for the sole purpose of prolonging VS/UWS beyond reasonable chances of recovery of consciousness to be medically futile  and a violation of human dignity . Hence, the aim of the present retrospective study was to use the 6-year post-injury assessment of long-term DOC patient outcomes (VS/UWS, MCS, E-MCS) in order to find the discriminating parameters in the EEG data recorded within 3 month post-injury. EEG measures that are based on the theory of consciousness are particularly attractive for this purpose1 because they have critical practical implications in the clinic , allowing indexing and distinguishing unconscious states from the presence of minimal or full consciousness [14, 43]. Operational architectonics (OA) methodology for EEG analysis [28, 30, 44, 45] is one of such approaches. A comprehensive review of this methodology can be found elsewhere [31, 46]. Here we provide only a brief summary. In short, according to the OA theory  local fields of transient functional neuronal assemblies are equivalent to operations that can be conscious (phenomenal2). For example, some neuronal assemblies display preferential processing for color, others for shape, yet others for motion, smell, etc. . Such simple operations responsible for qualia are reflected in the electrical brain field (EEG) in the form of local quasi-stationary segments that can be conceptualized as standing waves within a 3D volume (for a review see [31, 44-46]), and could be measured using adaptive EEG segmentation procedure [31, 46]. It has been experimentally shown that parameters of EEG segments (number, duration, amplitude, and others) are reliably and consistently correlated with changes in the phenomenal (subjective) content both during spontaneous (stimulus independent) and induced (stimulus dependent) experimental conditions . At the same time, to have a phenomenal experience of any complex object/concept or scene, several simple features of that object/concept/scene should be spatially and temporally integrated . According to OA theory, this complexity requires temporally coordinated operations (equivalent of synchrony of local bioelectrical fields) of many neural assemblies, which selectively emerge from the entire brain (for a detail discussion see ). This process can be measured directly using an EEG operational synchrony index [31, 46]. Several synchronized complexes of neuronal assemblies (so-called operational modules - OMs) can further synchronize among each other forming even more complex spatial-temporal structures, thus constituting a clear nested functional hierarchy  allowing a conscious mind to be expressed [29, 30, 45]. This OA strategy of EEG analysis has been validated in a number of electrophysiological, cognitive, and clinical studies and is proven to be robust, consistent, and statistically reliable (for a review see [29-31, 44-46]). OA analysis of DOC patients’ EEGs revealed that the absence of consciousness in patients in VS/UWS is paralleled by dramatic impairment of overall EEG operational architecture (Fig. 1): neuronal assemblies diminish, their life span shortens significantly, and they become highly unstable and functionally disconnected (desynchronized) from one another, including the default mode network [21, 29]. At the same time, fluctuating (minimal) awareness in patients in MCS was paralleled by partial restoration of EEG operational architecture: increased size, life span, and stability of neuronal assemblies, together with an increased number and strength of functional connections among them (Fig. 1),approaching the level found in healthy fully conscious participants [21, 29]. Foremost, OA methodology was able to reliably discriminate (at the group level) between patients in VS/UWS and MCS independent of brain damage etiology, thus indicating that OA EEG parameters capture consciousness phenomenon itself rather than physiological parameters of brain damage . Further, OA EEG parameters registered 3 months post-injury (in patients in VS/UWS) were able to reliably predict consciousness recovery 6 months post-injury . 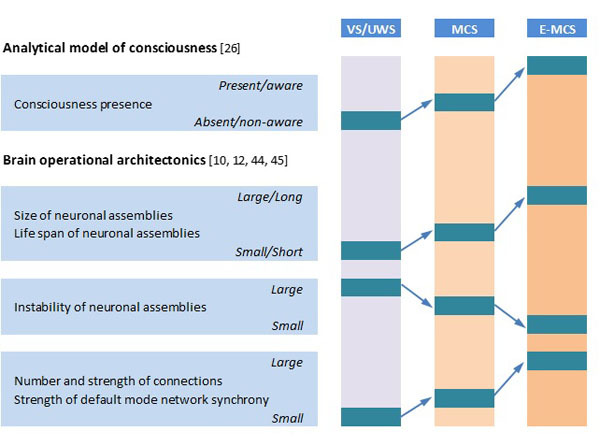 Schematic presentation of relation of analytical model of consciousness to brain (EEG) operational architectonics parameters. Abbreviations: EEG: electroencephalogram; VS/UWS: vegetative state/unresponsive wakefulness syndrome; MCS: minimally conscious state; E-MCS: emergence from minimally conscious state to full consciousness. Further explanations are provided in the text. In light of these results, it is reasonable to test whether EEG operational architectonics parameters could also be useful in determining very long-term (6 years) clinical outcomes of patients in VS/UWS whose EEGs were registered within 3 months post-injury. For the purpose of this pilot feasibility study, based on clinical evaluations at six years follow-up after the 3 month post-injury EEG registration, patients with traumatic brain injury who were admitted in Neurorehabilitation Unit at the Fondazione Istituto “San Raffaele - G. Giglio” and met the accepted international definition of VS/UWS [5, 50], were retrospectively divided into three groups: unrecovered - continued to be vegetative (VS-Pers), recovered minimally conscious state (VS-MCS), and recovered full consciousness - exit from MCS (VS-E-MCS). Patients’ demographic information is summarized in the Table 1. On the day of EEG registration (about 3 months post-injury) the Levels of Cognitive Functioning (LCF) scale score  was assessed to estimate the expression of clinical consciousness [10, 11]. The LCF has a linearly graded scale ranging from 1 to 8 (1 - patient is unconscious; 8 - patient is self-oriented and conscious of the environment) and is well correlated with resting-state EEG abnormalities in patients with brain damage [10, 11]. At the time of EEG scanning (about 3 months post-injury), all patients had an LCF score of 1 or 2 (1.3±0.6). Current LCF scores (6 years post-injury) are presented in the Table 1. Inclusion criteria for the patients to be recruited for this study were (a) being alive 6 years post-injury, (b) confirmation of diagnosis of VS/UWS, MCS or E-MCS according to the diagnostic criteria [5, 50], (c) first-ever acute brain event; (d) stable LCF score during 3 days after admission and six years later. Exclusion criteria comprised (a) death and (b) inconclusive LCF score. These inclusion/exclusion criteria resulted in the recruitment of three patients (from the pool of fourteen VS/UWS patients): one VS-Pers patient (age = 35 years), one VS-MCS patient (age = 55 years), and one VS-E-MCS patient (age = 19 years). The evaluations and manipulations (EEG recording) used for the purpose of this study did not interfere with the usual medical practice, or with the everyday rehabilitation therapies and were part of a routine screening of severe brain-injured subjects during their rehabilitation program. The study was approved by the local institutional Ethics Committee and complies with Good Medical Practice. Informed and overt consent by legal representatives of the patients was obtained, in line with the Code of Ethics of the World Medical Association (Declaration of Helsinki) and standards established by the Fondazione Istituto “San Raffaele - G. Giglio” Review Board. Data use was authorized by means of written informed consent of the VS/UWS patients’ caregivers. Basic demographic and clinical characteristics of patients. Waking resting EEG was recorded with a Neuropack (Nihon Kohden, Japan) from 19 electrodes positioned according to the International 10-20 system. The recording parameters were: 0.5-70 Hz bandpass; 200 Hz sampling rate; ~30 min. The impedance was below 5-10 kΩ. An electrooculogram (0.5-70 Hz bandpass) was also collected. Cephalic EEG reference (mean of the signals from C3 and C4 electrodes) was used. Even though there are propositions that the cephalic reference may result in an under- or over-estimation of the potentials, as we have discussed in  the amplitude variability (envelope) in the delta, theta, alpha, and beta bands did not vary significantly as a function of reference or measurement electrode impedance and that at present no agreement on a preferred solution to the reference issue is established . EEG recordings were started if patients had their eyes open spontaneously, the eyelids were then closed by hand and kept closed until the end of registration. At the end of the recordings all patients opened their eyes spontaneously, suggesting an unchanged vigilance level throughout EEG registration. The presence of an adequate EEG-signal was determined by visual inspection of the raw signal. Epochs containing artifacts due to eye movement, eyes opening, significant muscle activity, and movements on EEG channels were marked and then automatically excluded from further analysis. For each patient an artefact-free EEG stream was fragmented into consecutive 1-minute epochs. Further data processing was performed on each separate 1-minute epoch. Prior to OA analysis, each 1-minute epoch was bandpass-filtered (Butterworth filter of the sixth order) in the alpha (7-13 Hz), beta-1 (15-25 Hz) and beta-2 (25-30 Hz) frequency bands. Phase shifts were eliminated by forward and backward filtering. The mentioned frequency bands were chosen based on our previous studies involving DOC patients [21, 23, 29, 35] due to a fact that only these frequency oscillations have shown dynamics consistent with the analytical consciousness model . According to this model (Fig. 1), OA EEG features responsible for the subjective (un)awareness of self and environment should satisfy one of the following rules: (1) NORM > MCS > VS/UWS (for awareness) or (2) NORM < MCS < VS/UWS (for unawareness) . In short, the adaptive EEG segmentation algorithm can be described in two main stages (see for details [31, 46]): (1) preliminary identification of the boundaries between quasi-stationary segments using automated algorithm that moves a double window screening along each separate EEG channel; (2) selection of actual (real) boundaries based on the steepness of previously detected EEG amplitude changes and Student criteria. Three key EEG segment attributes were further estimated: (1) average amplitude within each segment (microvolts) - informs about the size of neuronal assemblies; (2) average length of segments (milliseconds) - informs about life-span of neuronal assemblies; (3) coefficient of amplitude variability within segments (%) - informs about instability of neuronal assemblies [26, 28, 31, 46]. Index of Operational Synchrony (for details see [31, 46]) estimates synchronization of EEG quasi-stationary segments obtained from different brain locations. In brief, each boundary in one EEG channel (from any pair of EEG channels) was surrounded by a short (ms) “window”. Any boundary from another channel was considered to coincide if it fell within this window. To arrive at a direct estimate of statistical significance (P < 0.05) of the index, computer simulation of boundaries coupling was undertaken based on random shuffling of segments (500 independent trials) for each pair of EEG channels [31, 46]. As a result of this procedure, the stochastic levels of boundaries coupling, together with the upper and lower thresholds of significance (P < 0.05) were calculated. If there is no synchronization, the index tends toward zero, whereas positive (above upper stochastic threshold) or negative (below lower stochastic threshold) values are indicative of synchronization (coupling of EEG segments is observed significantly more often than expected by chance as a result of random shuffling during a computer simulation) or de-synchronization (coupling of EEG segments is observed significantly less than expected by chance as a result of random shuffling during a computer simulation) respectively [31, 46].The strength of EEG operational synchrony is proportional to the actual value of the index in each pair of EEG channels: the higher this value, the greater the strength of functional connection among neuronal assemblies located in different cortical locations . The number of connections among neuronal assemblies corresponds to the number of statistically valid synchronous pairs of EEG channels  and is presented as a percent from the maximum possible number of connections among 19 EEG electrodes. 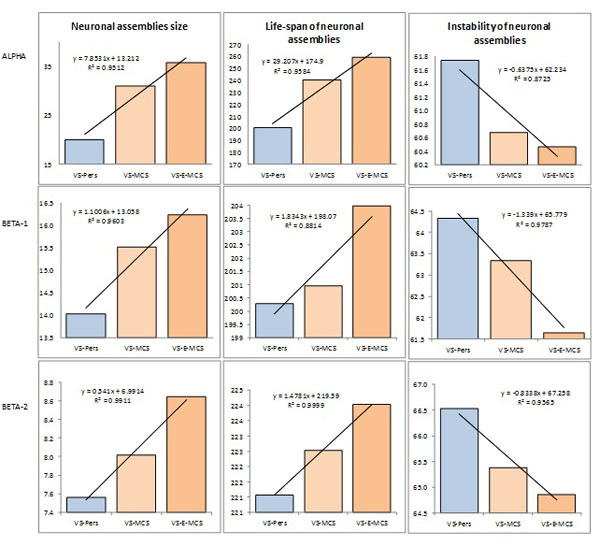 For each analysed state (VS-Pers, VS-MCS, and VS-E-MCS), averages and respective standard deviations were calculated for each of the EEG operational architectonics parameters (size of neuronal assemblies, life-span of neuronal assemblies, instability of neuronal assemblies, number and strength of functional connections among neuronal assemblies) for the whole pull of corresponding 1-minute EEGs (n of 1-minute EEGs for VS-Pers = 20, n for VS-MCS = 26, n for VS-E-MCS = 19). Robust linear regression analyses were performed across three states (VS-Pers, VS-MCS, and VS-E-MCS) for each OA EEG parameter to test for the relation (trend estimation) between changes observed across states of consciousness 6 years post-injury and studied EEG parameters 3 months post-injury. Such linear regression analysis that estimates a “trend line” is often used to argue that a particular parameter caused observed changes at a particular point in time . R-squared (R2) - indicates the square of the residuals of the data after the fit. R2 value of 0.8-0.9 indicates a nearly perfect fit of the prediction to the data, and R2 value of 1 indicates a perfect fit. From a purely statistical point of view, it is feasible to estimate the regression line with as few as 3 estimates if data change is not random ; therefore the three states in our study (VS-Pers, VS-MCS, and VS-E-MCS) are sufficient for this analysis. Fig. (2) presents the mean values and result of linear regression analysis for OA EEG segment attributes that characterize different features of neuronal assemblies for all EEG locations and three states of consciousness (VS-Pers, VS-MCS and VS-E-MCS). Corresponding data are presented separately for 3 features of neuronal assemblies (size of neuronal assemblies, life-span of neuronal assemblies, instability of neuronal assemblies). One can see, that all studied parameters followed identical relations among VS-Pers, VS-MCS and VS-E-MCS sates: a linear increase in “size” (R2 = 0.95–0.99 for different frequency bands) and “life-span” (R2 = 0.88–0.99 for different frequency bands), and decrease in “instability” (R2 = 0.87–0.97 for different frequency bands) from VS/UWS state (VS-Pers) to minimally conscious state (VS-MCS) and further to the emergence from minimally conscious state (VS-E-MCS) 6 years post-injury (Fig. 2). This observation was similar for all 3 frequency bands (alpha, beta-1, and beta-2). Fig. 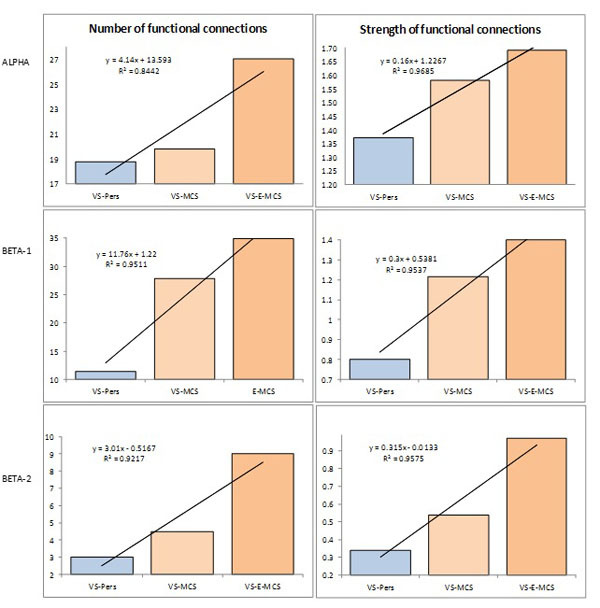 (3) presents the mean values and result of linear regression analysis for number and strength of functional connections for all EEG pair combinations that characterize remote functional connectivity between neuronal assemblies for three states of consciousness (VS-Pers, VS-MCS and VS-E-MCS). Corresponding data are organized the same way as in Fig. (2). We observed that both studied parameters followed identical relations among VS-Pers, VS-MCS and VS-E-MCS sates: a linear increase in “number” (R2 = 0.84–0.95 for different frequency bands) and “strength” (R2 = 0.95–0.96 for different frequency bands) of functional connections from VS/UWS state (VS-Pers) to minimally conscious state (VS-MCS) and further to the emergence from minimally conscious state (VS-E-MCS) 6 years post-injury (Fig. 3). A similar direction of differences was observed in all 3 (alpha, beta-1, and beta-2) frequency bands. Features and dynamics of neuronal assemblies (indexed by EEG segment attributes) as a function of clinical outcome 6 years post-injury: Linear regression analysis. Data are averaged across all EEG channels and all 1-minute EEGs within each state. The values of attributes of neuronal assemblies indicated by the Y-axis: size of neuronal assemblies-amplitude within each segment (microvolt); life-span of neuronal assemblies-length of segments (milliseconds); instability of neuronal assemblies-coefficient of amplitude variability within segments (%). Lines in the graphs represent the linear regression equation and R2. Abbreviations: Alpha: EEG rhythm 7-13 Hz; Beta-1: EEG rhythm 15-25 Hz; Beta-2: EEG rhythm 25-30 Hz. EEG: electroencephalogram; VS-Pers: patient continues to be in persistent vegetative state 6 years post-injury; VS-MCS: patient continues to be in minimally conscious state 6 years post-injury; VS-E-MCS: patient emerges from minimally conscious state 6 years post-injury. To the best of our knowledge, this is the first study of EEG parameters that has been registered in patients who meet all clinical criteria for the VS/UWS [5, 28] within 3 months post-injury and that could discriminate a very long-term (6 years) clinical outcomes of these patients. Here we have demonstrated that operational architectonics parameters of EEG structure have the capacity to discriminate patient in VS/UWS who continues to be in persistent VS/UWS from those who continue to be in MCS or even emerge from MCS (E-MCS) in a long-term perspective (6 years). More specifically, the larger the neuronal assemblies size, life-span, stability and functional connectedness among neuronal assemblies, the more likely a VS/UWS patient to partially or totally regain consciousness in a long-term perspective (Figs. 1, 2). These results are in line with an emerging consensus regarding modern understanding of the basic requirement for consciousness - the intact dynamic binding of operations performed by multiple neuronal assemblies, which are organized within a nested hierarchical brain architecture [16, 28-30, 53, 54]. In this context the state of unconsciousness would be characterized by brain cortical activity which is broken down into causally independent, small, and short-lived functional modules producing local responses not capable of supporting the subjective content [35, 41, 55] - which is exactly what we observed in persistent VS/UWS state (Figs. 1, 2). However, if these different parameters of brain operational architecture cross a threshold for the minimal neuronal mechanisms that are jointly sufficient for any single specific conscious content - the critical level at which awareness of the environment and of the self can be reliably supported and self-regulated by the brain, then the patient is likely to regain consciousness . Operational synchrony among neuronal assemblies (indexed by EEG segments synchronization) as a function of clinical outcome 6 years post-injury: Linear regression analysis. Data are averaged across all pairs of EEG channels and all 1-minute EEGs within each state. The Y-axis presents values of either number (%) or strength of functional connections. Lines in the graphs represent the linear regression equation and R2. Abbreviations: Alpha: EEG rhythm 7-13 Hz; Beta-1: EEG rhythm 15-25 Hz; Beta-2: EEG rhythm 25-30 Hz. EEG: electroencephalogram; VS-Pers: patient continues to be in persistent vegetative state 6 years post-injury; VS-MCS: patient continues to be in minimally conscious state 6 years post-injury; VS-E-MCS: patient emerges from minimally conscious state 6 years post-injury. Further, similar effects across alpha and beta frequency bands observed in this study (Figs. 1, 2) extend several lines of evidence on the strong implication of cortical alpha and beta rhythms for human higher functions and consciousness [20, 29, 56, 57]. This interpretation is in line with current views that conscious awareness might depend on the dynamic formation-disassembling of neuronal assemblies synchronized on different temporal scales across various frequency bands [58-61]. It is important to keep in mind that although patients (who six years after brain-injury reached MCS or even E-MCS condition) have demonstrated evidence of EEG operational architecture closer to actual patients in MCS or normal fully conscious subjects, they all were in VS/UWS condition during the EEG registration and their EEG operational architecture parameters did not differ from the analogues parameters estimated on the group level of patients in VS/UWS . To conclude, the results of the present study suggest that EEG recorded at third month following brain damage, when reliable communication with patients could not yet be established and before spontaneous EEG showed significant modifications in the conventional (based on spectral analysis) parameters (see Table 1), if analyzed by the methods that tailored towards detecting parameters of consciousness rather than to neurophysiological processes [35-42], contains potentially useful information on the outcome of persistent VS/UWS patients 6 years later. However, despite such promising findings, the very low number of investigated patients (one patient for each state: VS/UWS, MCS, E-MCS) suggests that evaluation of the results should be done with caution before providing indications for clinicians and should be considered preliminary. To confirm the results presented in this article, future prospective studies with a larger group of patients for each state are warranted. Nevertheless, the preliminary results of the present study are strengthened by the fact that the characterizations of the states (VS/UWS, MCS and E-MCS) in terms of EEG operational architectonics revealed in the present study coincide precisely with our previous EEG studies of DOC patients [21, 23, 29, 35]. Moreover, in trend analysis (linear regression) that has been used in the present study as a main statistical method, the observations (or units of analysis) relate to time periods (years, months, days) and not to individuals . Another possible interpretation of the results may relate to the age and the extent of the brain damage (see Table 1). Even though such interpretation may have sense for the youngest patient with the smallest brain damage who recovered full consciousness, it fails with the patient who continued to “stay” in the VS/UWS and who had the intermediate age and brain damage when compared with MCS patient and E-MCS patient (Table 1). Therefore, it is unlikely that age and extend of brain damage could explain the results of the current study. Furthermore, in  it has been argued with the examples, that loss of consciousness most likely is related with functional alterations in cortical structures and impairment in relations between them, rather than with particular brain lesions and the amount of brain damage. However, to confirm the presented results in this paper, future studies that include a larger group of patients is warranted. The authors received no financial support or funding for the research, authorship, and/or publication of this article. The authors thank C. Prestandrea (neurophysiology technician) for EEG recordings; C. Neves (Computer Science specialist) for programming, technical, and IT support; D. Skarin for English editing. Monti MM, Laureys S, Owen AM. The vegetative state. BMJ 2010; 341: c3765. Braakman R, Jennett WB, Minderhoud JM. Prognosis of the posttraumatic vegetative state. Acta Neurochir (Wien) 1988; 95(1-2): 49-52. Klein AM, Howell K, Straube A, Pfefferkorn T, Bender A. Rehabilitation outcome of patients with severe and prolonged disorders of consciousness after aneurysmal subarachnoid hemorrhage (aSAH). Clin Neurol Neurosurg 2013; 115(10): 2136-41. Laureys S, Celesia GG, Cohadon F, et al. Unresponsive wakefulness syndrome: a new name for the vegetative state or apallic syndrome. BMC Med 2010; 8: 68. The vegetative state: guidance on diagnosis and management. A report of a working party of the Royal College of Physicians. Clin Med 2003; 2: 249-54. Giacino JT, Ashwal S, Childs N, et al. The minimally conscious state: definition and diagnostic criteria. Neurology 2002; 58(3): 349-53. Fins JJ. Brain injury: The vegetative and minimally conscious states. In: Crowley M, Ed. From Birth to Death and Bench to Clinic: The Hastings Center Bioethics Briefing Book for Journalists, Policymakers, and Campaigns. Garrison, NY: The Hastings Center 2008; pp. 15-20. Schiff ND, Nauvel T, Victor JD. Large-scale brain dynamics in disorders of consciousness. Curr Opin Neurobiol 2014; 25: 7-14. Guérit JM, Amantini A, Amodio P, et al. Consensus on the use of neurophysiological tests in the intensive care unit (ICU): electroencephalogram (EEG), evoked potentials (EP), and electroneuromyography (ENMG). Neurophysiol Clin 2009; 39(2): 71-83. Bagnato S, Boccagni C, Prestandrea C, Sant’Angelo A, Castiglione A, Galardi G. Prognostic value of standard EEG in traumatic and non-traumatic disorders of consciousness following coma. Clin Neurophysiol 2010; 121(3): 274-80. Boccagni C, Bagnato S, Sant Angelo A, Prestandrea C, Galardi G. Usefulness of standard EEG in predicting the outcome of patients with disorders of consciousness after anoxic coma. J Clin Neurophysiol 2011; 28(5): 489-92. Kotchoubey B, Lang S, Mezger G, et al. Information processing in severe disorders of consciousness: vegetative state and minimally conscious state. Clin Neurophysiol 2005; 116(10): 2441-53. Sitt JD, King JR, El Karoui I, et al. Large scale screening of neural signatures of consciousness in patients in a vegetative or minimally conscious state. Brain 2014; 137(Pt 8): 2258-70. Synek VM. EEG abnormality grades and subdivisions of prognostic importance in traumatic and anoxic coma in adults. Clin Electroencephalogr 1988; 19(3): 160-6. Sarà M, Pistoia F, Pasqualetti P, Sebastiano F, Onorati P, Rossini PM. Functional isolation within the cerebral cortex in the vegetative state: a nonlinear method to predict clinical outcomes. Neurorehabil Neural Repair 2011; 25(1): 35-42. Gosseries O, Schnakers C, Ledoux D, et al. Automated EEG entropy measurements in coma, vegetative state/unresponsive wakefulness syndrome and minimally conscious state. Funct Neurol 2011; 26(1): 25-30. Lehembre R, Marie-Aurélie B, Vanhaudenhuyse A, et al. Resting-state EEG study of comatose patients: a connectivity and frequency analysis to find differences between vegetative and minimally conscious states. Funct Neurol 2012; 27(1): 41-7. Fingelkurts AnA, Fingelkurts AlA, Bagnato S, Boccagni C, Galardi G. Life or death: prognostic value of a resting EEG with regards to survival in patients in vegetative and minimally conscious States. PLoS One 2011; 6(10): e25967. Fingelkurts AnA, Fingelkurts AlA, Bagnato S, Boccagni C, Galardi G. EEG oscillatory states as neuro-phenomenology of consciousness as revealed from patients in vegetative and minimally conscious states. Conscious Cogn 2012; 21(1): 149-69. Fingelkurts AnA, Fingelkurts AlA, Bagnato S, Boccagni C, Galardi G. DMN operational synchrony relates to self-consciousness: Evidence from patients in vegetative and minimally conscious states. Open Neuroimaging J 2012; 6: 55-68. Fingelkurts AnA, Fingelkurts AlA, Bagnato S, Boccagni C, Galardi G. The value of spontaneous EEG oscillations in distinguishing patients in vegetative and minimally conscious states. Suppl Clin Neurophysiol 2013; 62: 81-99. Fingelkurts AnA, Fingelkurts AlA, Bagnato S, Boccagni C, Galardi G. Prognostic value of resting-state electroencephalography structure in disentangling vegetative and minimally conscious states: a preliminary study. Neurorehabil Neural Repair 2013; 27(4): 345-54. Höller Y, Thomschewski A, Bergmann J, et al. Connectivity biomarkers can differentiate patients with different levels of consciousness. Clin Neurophysiol 2014; 125(8): 1545-55. Mesin L, Costa P. Prognostic value of EEG indexes for the Glasgow outcome scale of comatose patients in the acute phase. J Clin Monit Comput 2014; 28(4): 377-85. Nunez PL. Toward a quantitative description of large-scale neocortical dynamic function and EEG. Behav Brain Sci 2000; 23(3): 371-98. John ER. The neurophysics of consciousness. Brain Res Brain Res Rev 2002; 39(1): 1-28. Fingelkurts AnA, Fingelkurts AlA. Mapping of the brain operational architectonics. In: Focus on Brain Mapping Research. NewYork: Nova Science Publishers Inc 2005; pp. 59-98. Fingelkurts AnA, Fingelkurts AlA, Bagnato S, Boccagni C, Galardi G. Toward operational architectonics of consciousness: basic evidence from patients with severe cerebral injuries. Cogn Process 2012; 13(2): 111-31. Fingelkurts AnA, Fingelkurts AlA, Neves CFH. Consciousness as a phenomenon in the operational architectonics of brain organization: Criticality and self-organization considerations. Chaos Solitons Fractals 2013; 55: 13-31. Fingelkurts AnA, Fingelkurts AlA. Operational architectonics methodology for EEG analysis: Theory and results. Neuromethods 2015; 91: 1-59. Rossi Sebastiano D, Panzica F, Visani E, et al. Significance of multiple neurophysiological measures in patients with chronic disorders of consciousness. Clin Neurophysiol 2015; 126(3): 558-64.
 de Beaufort I. Patients in a persistent vegetative state-a Dutch perspective. N Engl J Med 2005; 352(23): 2373-5. KNMG (Royal Dutch Medical Association) Commissie Aanvaardbaarheid Levensbeëindigend handelen Medisch handelen rond het levenseinde bij wilsonbekwame patiënten [Medical end-of-life practice for incompetent patients: Patients in a vegetative state] [in Dutch] Houten/Diegem: Bohn Stafleu Van Loghum; 1997. Fingelkurts AnA, Fingelkurts AlA, Bagnato S, Boccagni C, Galardi G. Dissociation of vegetative and minimally conscious patients based on brain operational architectonics: factor of etiology. Clin EEG Neurosci 2013; 44(3): 209-20. Overgaard M, Overgaard R. Measurements of consciousness in the vegetative state. Lancet 2011; 378(9809): 2052-4. Kotchoubey B, Lang S, Bostanov V, Birbaumer N. Is there a mind? Electrophysiology of unconscious patients. News Physiol Sci 2002; 17: 38-42. Schnakers C, Zasler ND. Pain assessment and management in disorders of consciousness. Curr Opin Neurol 2007; 20(6): 620-6. Boly M, Massimini M, Tononi G. Theoretical approaches to the diagnosis of altered states of consciousness. Prog Brain Res 2009; 177: 383-98. Fingelkurts AnA, Fingelkurts AlA, Bagnato S, Boccagni C, Galardi G. Do we need a theory-based assessment of consciousness in the field of disorders of consciousness? Front Hum Neurosci 2014; 8: 402. Tononi G. Consciousness as integrated information: a provisional manifesto. Biol Bull 2008; 215(3): 216-42. Kotchoubey B, Lang S. Intuitive versus theory-based assessment of consciousness: the problem of low-level consciousness. Clin Neurophysiol 2011; 122(3): 430-2. Bagnato S, Boccagni C, Sant’angelo A, Fingelkurts AA, Fingelkurts AA, Galardi G. Emerging from an unresponsive wakefulness syndrome: brain plasticity has to cross a threshold level. Neurosci Biobehav Rev 2013; 37(10 Pt 2): 2721-36. Fingelkurts AnA, Fingelkurts AlA. Operational architectonics of the human brain biopotential field: towards solving the mind-brain problem. Brain Mind 2001; 2(3): 261-96. Fingelkurts AnA, Fingelkurts AlA, Neves CF. Natural world physical, brain operational, and mind phenomenal space-time. Phys Life Rev 2010; 7(2): 195-249. Fingelkurts AnA, Fingelkurts AlA. Brain-mind Operational Architectonics imaging: technical and methodological aspects. Open Neuroimaging J 2008; 2: 73-93. Nagel T. What is it like to be a bat? Philos Rev 1974; 83: 435-50. Zeki S. Insights into visual consciousness. In: Frackowiak RS, Friston KJ, Frith CD, Eds. Human Brain Function. San Diego, CA: Elsevier 2004. Fingelkurts AnA, Fingelkurts AlA. Mind as a nested operational architectonics of the brain: Comment on “Neuroontology, neurobiological naturalism, and consciousness: a challenge to scientific reduction and a solution” by Todd E. Feinberg. Phys Life Rev 2012; 9(1): 49-50. The Multi-Society Task Force on PVS. Medical aspects of the persistent vegetative state (2). N Engl J Med 1994; 330(22): 1572-9. Gouvier WD, Blanton PD, LaPorte KK, Nepomuceno C. Reliability and validity of the Disability Rating Scale and the Levels of Cognitive Functioning Scale in monitoring recovery from severe head injury. Arch Phys Med Rehabil 1987; 68(2): 94-7. Makridakis SG, Wheelwright SC, Hyndman RJ. Forecasting: methods and applications. 3rd ed. New York: John Wiley & Sons 1998. Davis JJ, Kozma R. Creation of knowledge and meaning manifested via cortical singularities in cognition, - towards a methodology to understand intentionality and critical behavior in neural correlates of awareness. In: Proceedings of the International Conference of Awareness and Computing. Singapore: IEEE Press 2013.2013 April 16-19; Singapore: IEEE Press 2013. Freeman WJ. Nonlinear brain dynamics and intention according to Aquinas. Mind Matter 2006; 6(2): 207-34. Overgaard M. How can we know if patients in coma, vegetative state or minimally conscious state are conscious? Prog Brain Res 2009; 177: 11-9. Palva S, Palva JM. New vistas for alpha-frequency band oscillations. Trends Neurosci 2007; 30(4): 150-8. Palva S, Palva JM. Functional roles of alpha-band phase synchronization in local and large-scale cortical networks. Front Psychol 2011; 2: 204. Başar E, Başar-Eroglu C, Karakaş S, Schürmann M. Gamma, alpha, delta, and theta oscillations govern cognitive processes. Int J Psychophysiol 2001; 39(2-3): 241-8. Varela F, Lachaux JP, Rodriguez E, Martinerie J. The brainweb: phase synchronization and large-scale integration. Nat Rev Neurosci 2001; 2(4): 229-39. Le Van Quyen M. The brain web of cross-scale interactions. New Ideas Psychol 2011; 29(2): 57-63. Monto S. Nested synchrony-a novel cross-scale interaction among neuronal oscillations. Front Physiol 2012; 3: 384. Rosenberg D. Trend Analysis and Interpretation Division of Science, Education, and Analysis Maternal and Child Health Bureau, HRSA, PHS, DHHS, Maryland. 1997.